Also known as the greatest thing I ever brought to a party. I first found this recipe on pinterest, but it originated from Two Tiny Kitchens. I made this a few weeks ago on a Friday where I had a knitting night and a baby shower I had to bring something to. Which means I made a boatload. And how many did I bring home? Zero. That’s how good they were. You know how you bring food to a gathering sometimes and try to give away the leftovers and you can tell people take them reluctantly to be polite? Yeah, I didn’t even have to ask. People asked me. 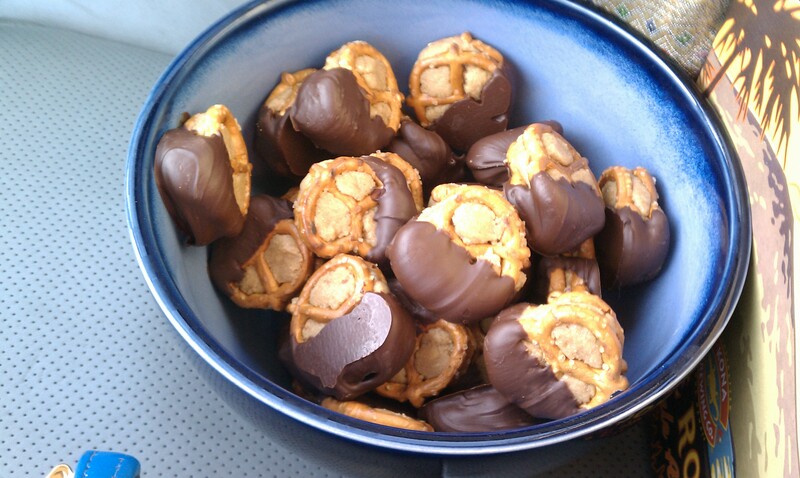 That’s right baby, from now on I will only be making peanut butter pretzel bites to take to soirees. These are ridiculously easy to make. The hardest part is the assembly, but only because it takes a million years when you’re making 100 of them. If I were to do them over again I would put the melted chocolate into a piping bag and drizzle it over the bites. Dipping them in chocolate as the original recipe calls for left a big hunk of chocolate to bite into. I think a generous drizzle of chocolate over the whole pretzel would have tasted better, as the chocolate flavor would have been evenly distributed, and would have been easier to eat. The original recipe says that the amount of sugar you’ll need may vary. I really found this to be the case. I think it has more to do with the type of peanut butter you use than anything else. I used an all-natural peanut butter that was just peanuts and salt, so there was a lot of peanut oil in it, making it pretty soft. The sugar acts like a thickening agent, so I’ll tell you how much I used, but know that you may use more or less depending on your peanut butter. The consistency is what you’re looking for more than anything. These are in no way good for you. But they are amazing. On to the recipe. As I mentioned before, this made about 100 bites, so if you want to make less you might want to half it, or follow the amounts noted in the original recipe. Mix peanut butter and butter together in a large bowl. Slowly mix in sugars, checking consistency as you go. 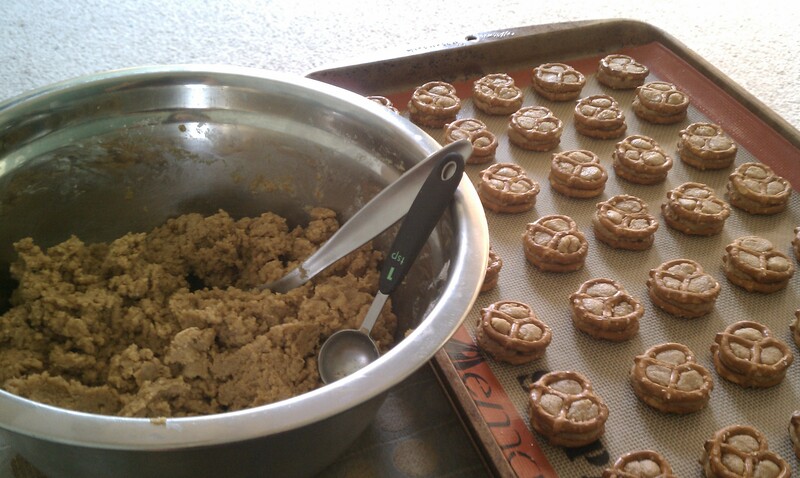 You’re looking for the peanut butter mixture to become dry enough to roll into balls without sticking to your hands. Scoop out a heaping teaspoon of filling and form it into a ball, then sandwich it gently between two pretzels. 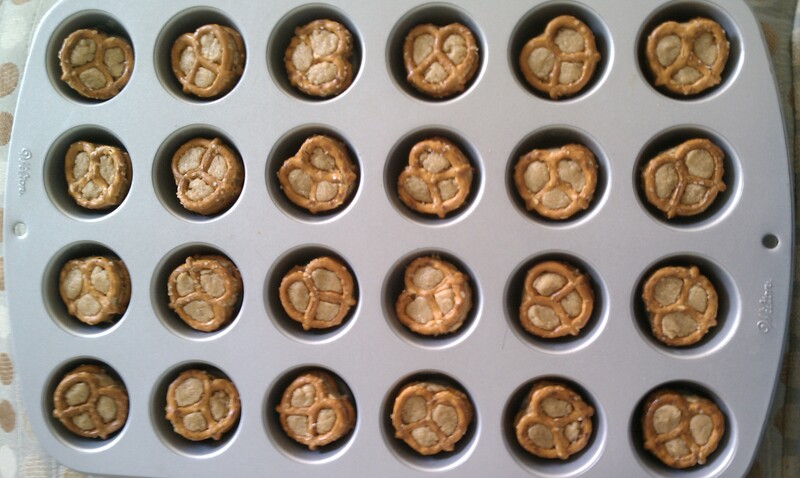 Lay out the pretzels on a baking pan lined with a silpat or parchment paper to avoid sticking. I made so many that I had to get creative with how I laid them out. A girl only has so many baking pans. Put the pretzels in the freezer for at least half an hour to get them cold enough for the chocolate to set. Once they’re chilled, melt the chocolate chips in the microwave, stirring until smooth. 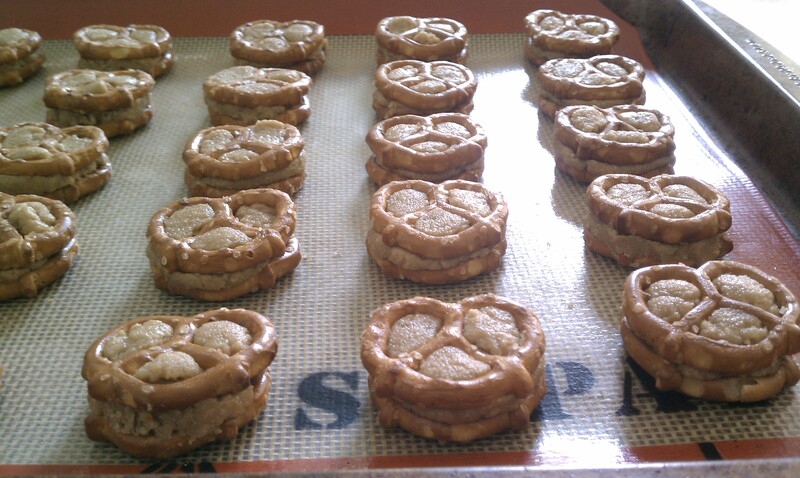 Dip each pretzel into the chocolate (or drizzle with a piping bag) and lay them back on the cookie sheet. Put the dipped pretzels back in the freezer until the chocolate is totally set, and store them in the fridge until you’re ready to serve up the peanutey chocolatey goodness. Stand back, and watch people go nuts. ← Done With #1 – Do You Feel the Allure? Oooh, these look AMAZING. I’ll have to make them soon! Oh, dear cod. (Yes, I meant cod like the fish. lol.) — is this payback for last week with the lemon bars? I’m sorry, okay!! Yeah . . . you know these are going on my Pinterest! I have made these many times since you first introduced them to me. So easy and so good!! I did the chocolate drizzle last time and it was good but I didn’t use enough chocolate per pretzel. Love these!!!! Wow niece, these look really good. I will be making them! !